We’re a day late in starting our final week of First Pick Designer profiles, so we’re kicking it up a notch and going To The Max! This week is all about designers whose collections take things just that little bit further, who make a statement and embrace their style fully… Designers like Trudy Wynans, whose One of a Kind assemblage designs combine a bit of everything for maximum effect. 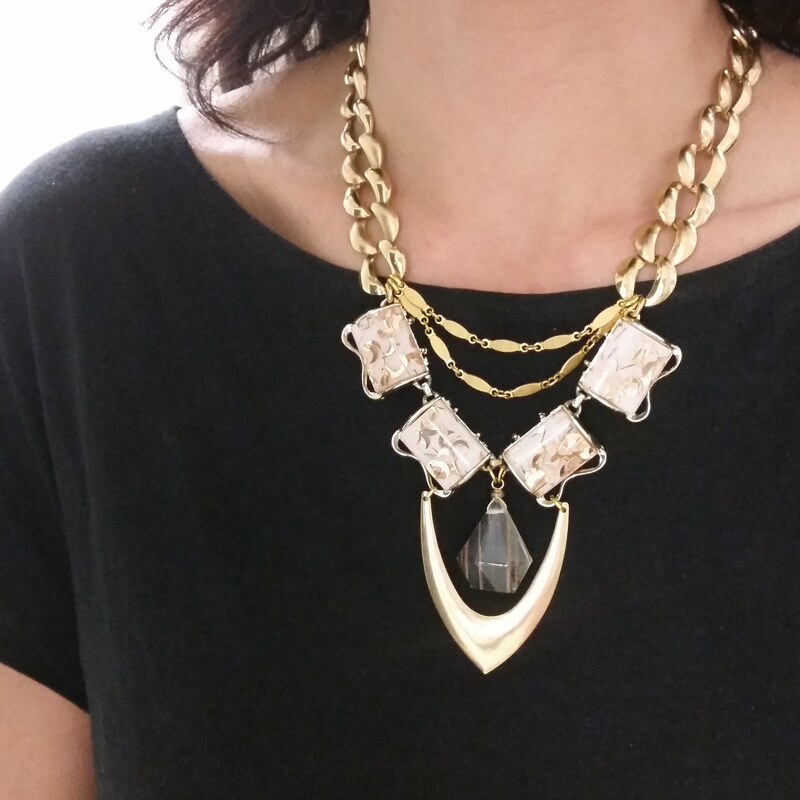 We’re very excited to welcome Toodlebunny back to our second Fall show, we know Trudy’s statement pieces are always a crowd favourite, us included! 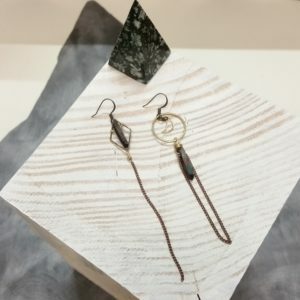 We love the artful combinations of vintage chain, vintage charms, repurposed elements and natural crystals that give all of Toodlebunny’s pieces such a distinct look. Lots of new one of a kind asymmetrical style earrings. I’ve been designing mismatched earrings since the very beginning of my jewelry business, just over 12 years now. Most were my signature designs that I did production with and made many of the same design. This fall I’ll be creating versions of a similar asymmetric style using recycled elements so that each design will slightly tweaked to be one of a kind. What inspires your work? What inspired your Fall collection? I’m constantly inspired by my materials and vintage finds. The challenge of recycling vintage elements into my work to create these one of a kind pieces keeps me wanting to see how far I can push the limits with the design. I’m currently obsessed with bright pops of color in my work but coming closer to Fall I’ll probably veer back to classic black and gold. How is your collection eco-friendly/ slow fashion/ thoughtful/ sustainable? Why do you choose to work in this way, given the extra effort involved with eco/green production? 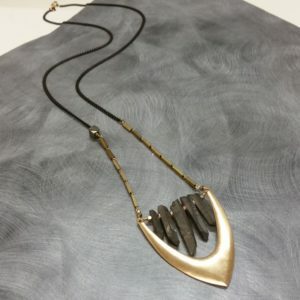 I re-purpose a lot of the components I use in my jewelry designs and enjoy the process of thinking out of the box on how to incorporate a certain piece into my work. 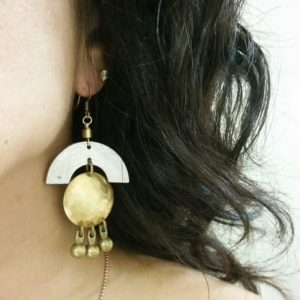 It may be a discarded or broken piece of vintage jewelry like a brooch that has some cool elements that I can reuse or saving the silk thread from temporary strung beads to re-purpose into colorful handmade tassels. I’m always looking at something and thinking how can I reuse that or save it from being thrown out. 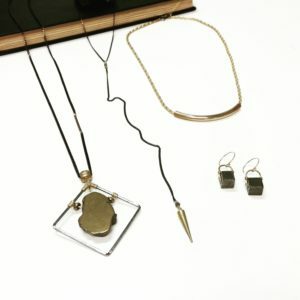 I have to put my own spin on the components to create something unique in the land of assemblage jewelry, making most of my pieces one of a kind or limited to one of a few.